If you are interested in a bathroom remodel for your home in the North Dallas, Texas, area, allow the skilled professionals at Star Home Remodeling to assist you. Since our founding in 2007, we have been helping homeowners like yourself customize their properties to enhance beauty, functionality, and value, and we’ll be happy to do the same for you! Here at Star Home Remodeling, we understand that you likely have a unique vision for your updated bathroom, and we want to help turn that dream into a reality. We’ll do this by meeting with you for a design consultation at our showroom or your home. During this time, we’ll learn about the ideas you have for your renovation and provide you with all of the information you need to make the best decisions. We believe that encouraging customers to take their time and consider all options is key to a successful bathroom remodel. We’ll never pressure you to make hasty decisions or sugarcoat costs of services and products. You can rest assured that, when you partner with us for your remodel, you’re working with a no-nonsense and honest company that’s committed to customer satisfaction. 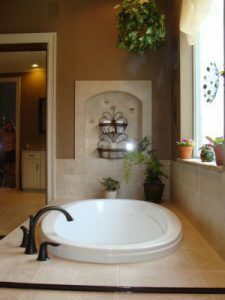 Additionally, turning to us for your bathroom remodel means you won’t need to hire multiple companies for the project. We are a full-service home improvement company that can execute every aspect of your remodel. For more information about the bathroom remodel we can complete at your home in the North Dallas, TX, area, contact Star Home Remodeling today. We’ll be happy to answer any questions you have and schedule you for a consultation.